My dearest lovely readers. I realize I’ve been somewhat absent here and in my online communities the past week, except for the occasional photo post of my refrigerator contents or the facebooking references to the contest I’m in (Vote HERE and “like” me on FB here) or the random tweets (follow me here). Alas, my life has been hectic chaos lately. By hectic, I mean sinus infections and migraines and just when I thought I was getting better, I pulled a muscle in my back that knocked me flat. By chaos, I mean my husband has taken over most of my motherly-duties and my meds were making me loopy. Which basically meant that he did things like put the opened organic cranberry juice in the cabinet, but I no longer cared. By loopy, I mean loopier than my normal typical self. Alas. Bear with me here. This is what I’ve been up to. When I wasn’t laying in flat-out agony, I mean. I pulled this meal together a few nights ago. It was quick, easy, and simple enough I could manage it right now. I’ve never loved to eat fish, but this stuff was incredible. Yummy huh? Yes. It was. 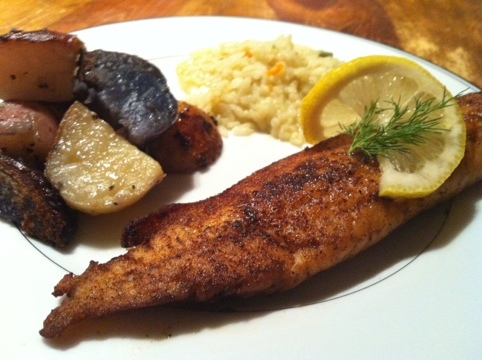 Tilapia, gourmet potatoes, and risotto. With that side of bad back. This was very easy. Even injured. No, I don’t whine and complain much. Why do you ask? I used a 28 oz package of Tasteful Selections potatoes and quartered them. I placed them in a skillet and added just enough water to not quite cover them and brought it to a boil and let cook uncovered. 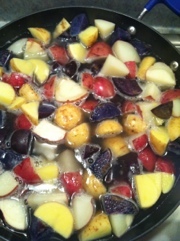 These are my favorite potatoes…I use the Sunrise Medley the most, and their fingerlings are wonderful as well. Delicious little things. Trust me. I let the water boil almost entirely out. 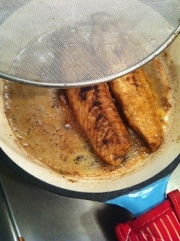 Then I added a teaspoon of kosher salt, a teaspoon of crushed black pepper, and two tablespoons of butter. I let them slightly sauté until the outside started to crisp. Meanwhile, I prepped the garlic risotto. It was a GF box mix from Lundberg, shown here. I followed the directions on the box. Honest! Rare for me, I know. Then. 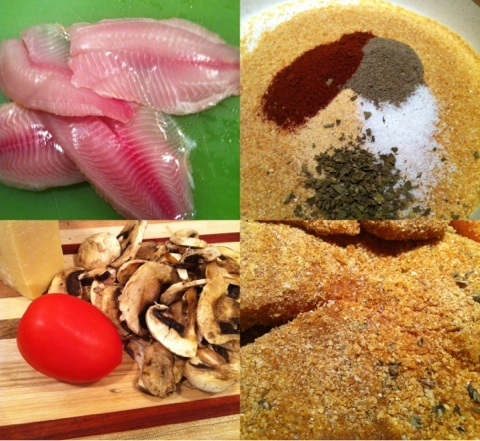 For the fish I used a recipe from a friend and made a few tweaks (I had tilapia on hand, instead of his flounder) and fried it in a heavy cast iron skillet. His original recipe is here. 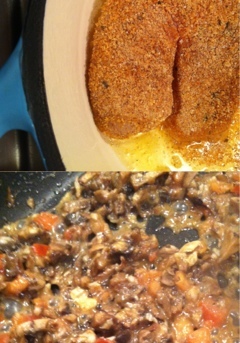 I basically dredged the filets in butter and then in the seasoning mix, and fried them. Click the link, check it out, and go try it! PS. Best things about cooking with a back that is a mess? I finally have a valid excuse for not being able to load the dishwashers. 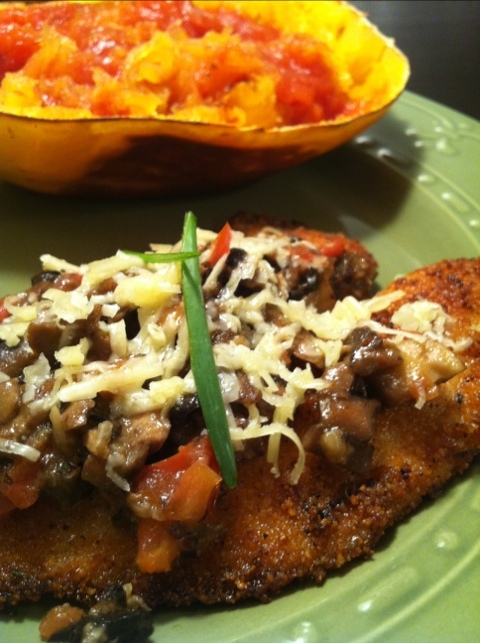 Posted in main courses, quick weeknight meals, Reviews: foods and tagged gluten free, Lundberg, meals, Potatoes, risotto, Tasteful Selections, tilapia. Bookmark the permalink.